Origin, which was formally called EA Download Manager, is an online gaming, digital distribution and digital rights management platform. 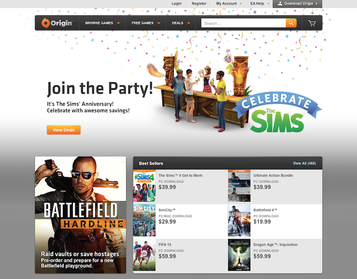 EA (Electronic Arts) uses Origin as a game channel, on which users get access to purchase and launch its games. Sims 4 is currently one of their most popular games. The application also has social features like networking with friends with chat, profile management and direct game joining along with an in-game overlay, streaming via TwitchTV and sharing of game library and community.